Do you share a single bathroom with the rest of your family? When renovating this facility, you likely don't want to overlook anyone in your design choices. Instead, take care to find amenities to please mom, dad and the kids. Though many may base a family bathroom on function rather than style, you don't need to completely deprive yourself of luxury. The Press and Journal showcased a home in which the family bathroom had everything from a bidet to a Jacuzzi. You may not want to get quite this decadent, but why not treat yourself a little? Ladies using the bathroom probably wouldn't mind a nice place to put on their make up on in the morning. Instead of resorting to a basic mirror on the wall, you could install a beautiful bathroom vanity instead. Whether an antique or modern furnishing, these pieces can be truly elegant. 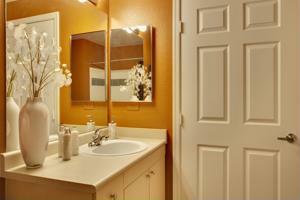 You may be able to find one with an intricately designed mirror or an engraved counter surface. Whichever style you choose, it's important that the piece has plenty of storage space for lotions, cosmetics and other toiletries. Kids will use the vanity too, so you'll likely want to pick a durable material for the piece. HGTV suggests choosing a material that can withstand wear and tear, like granite. "You don't have to worry about them scratching or staining. You'll spend more on them than you would laminate, but they're low maintenance and will look good for a long time," Sara Ann Busby of the National Kitchen and Bath Association said to the source. Escape from the hustle and bustle of the daily grind with a luxurious steam shower. These pieces come with a number of features, from massaging jets to mood lighting, that'll make any stressed-out parent feel revitalized. If your children are small, you may want to have a bathtub in the bathroom as well. Though you might go with a basic, traditional design like a clawed foot tub, you could also get fancy with your bathtub choice. By choosing a whirlpool tub with jets along the sides, your kids may never complain about having to take a bath again. Of course, if you need some serious relaxation, you can indulge in this Jacuzzi-style bath too. With these fixtures in place, the whole family will enjoy the bathroom they share.